Kirk in the Hills was the dream and vision of Colonel Edwin S. George, a Detroit businessman whose gift of his home and estate (Cedarholm) in 1947 made the Kirk possible. The congregation was organized by the Presbytery of Detroit in 1947, and the first services were held in Cedarholm Chapel (formerly Colonel George’s music room). Exactly eleven years after it was organized, the Kirk held its first services in the sanctuary on November 23, 1958. 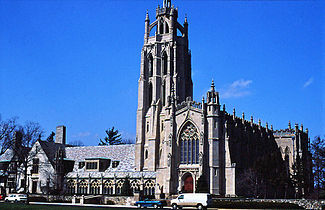 Patterned after Scotland’s Melrose Abbey, Kirk in the Hills is a majestic, gothic-style church, located on a 41-acre lakeside setting 20 miles north of Detroit. Characteristics of Gothic architecture include vertical lines, flying buttresses, pointed arches, lightness and soaring spaces.